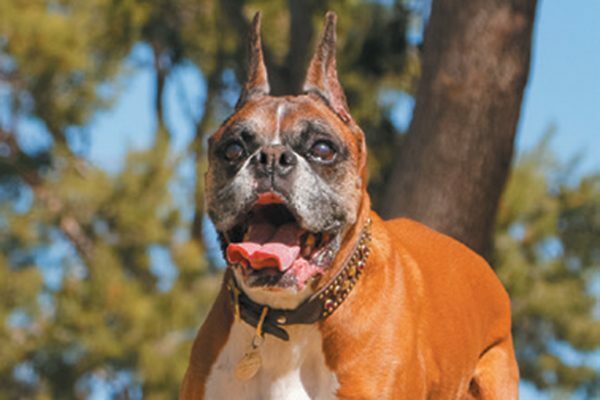 When you stroll through a city park with your favorite canine companion, you’ll probably see dozens of other dogs. Most of them are like yours: someone’s best friend, walking buddy, or favorite snuggling partner. But some of those dogs are different — they have jobs! Aside from being great buddies, dogs perform a variety of functions to help improve the lives of their humans. Let’s explore a few of the various types of working dogs — therapy dogs, service dogs, emotional support dogs and more — you may encounter in your community. A service dog at work. Photography by Lissandra Melo/ Shutterstock.com. Service dogs are working dogs who have been trained to perform tasks that make life easier and/or safer for those who are legally disabled. There are about a zillion other tasks service dogs can do — pushing doors closed and open, reminding their handlers when it’s time for medication, retrieving nearly anything, loading and unloading the laundry into baskets, turning the lights on and off, and even calling 911 in a crisis. When service dogs are working in public, do not approach or harass them. Trust me, I know it’s hard to avoid a cute dog, but exercise some impulse control — that dog is working hard to keep her person safe! 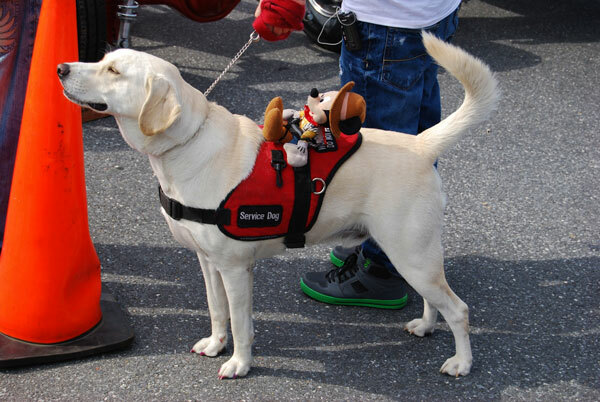 While service dogs often wear vests, they are not required to. 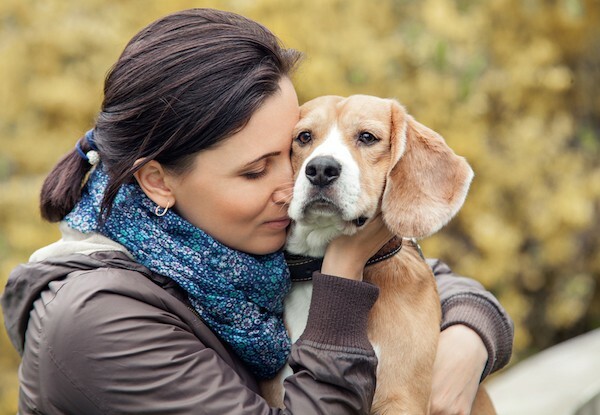 Woman hugging a dog. Photography by Shutterstock. Therapy dogs may be any breed of appropriate temperament. While service dogs work to mitigate the disability of a single person, therapy dogs are generally exceptionally friendly and well-trained pets who are not generally task-trained except for really cute and fun tricks. They may visit hospitals, reading programs, rehabilitation centers and even courtrooms. Therapy dogs are not permitted public access, except in the environments where they are working for the hours they are scheduled to work. They cannot go into restaurants, on public transportation where pets are not generally permitted, in stores or to the doctor’s office. They may wear special vests while working. Therapy dogs are often certified through various organizations like Therapy Dogs International. It is important to note that service dogs are not therapy dogs, and therapy dogs are not service dogs; the two are often confused. 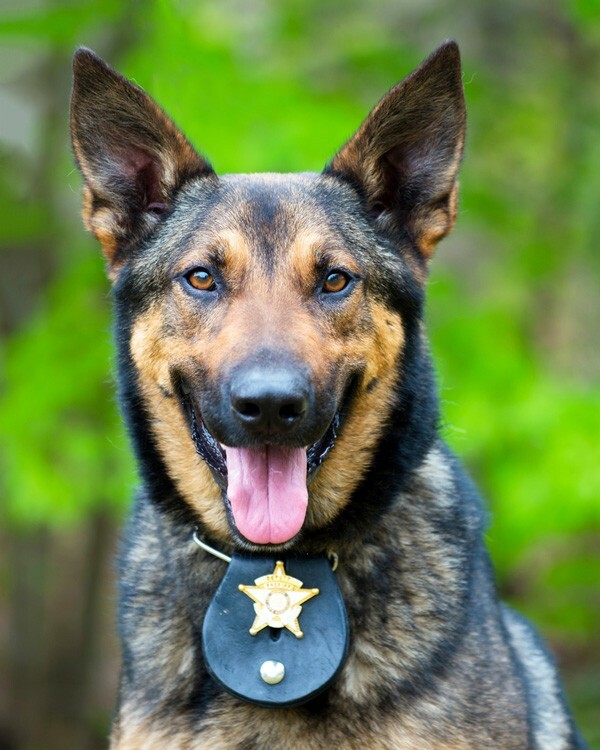 What Are Law Enforcement and Military Working Dogs? A working police dog. Photography by Shutterstock. Detection: Dogs may learn to detect the presence of illegal items, including nonnative flora and fauna, at national borders; they may detect drugs, weapons, and evidence in our communities, or alerting soldiers to the presence of landmines; or they may even sniff out the poop of rare animals for conservation purposes. Protection and apprehension: Some dogs are trained to chase down and apprehend suspects while protecting their handlers. These dogs are permitted public access when they are on duty. Many of them spend their evenings relaxing as family pets and their days working hard to keep us safe. Again, these dogs should not be approached, distracted, or otherwise engaged while working. Woman and Westie. Photography by Shutterstock. These dogs provide therapeutic benefits to legally disabled handlers through companionship. They are not task-trained like their service dog brethren, and are therefore not entitled to the same public access rights.They are, however, eligible to live in housing where pets are otherwise banned, and also may travel with their handlers on airlines (though you may be asked to provide written verification from a medical or mental health professional regarding your dog’s ESA status). This category includes Border Collies that live their lives helping out on the ranch or are hired by local golf courses to scare the oft-pooping migrating geese away; Jack Russells who keep the farm free of vermin; and livestock guardians that protect the flock at night. Working pets may be the rarest of all breeds, which is why you’ll need to find your dog new jobs (like agility, nosework, rally obedience, etc.) to keep him happily engaged and active. Do you know of any working dogs, therapy dogs or service dogs in your community? Does your dog have a very important job? If so, please share in the comments! The post The Differences Between Service Dogs and Therapy Dogs appeared first on Dogster.